How to draft a proper Thank You Letter for Receipt of a Consumer Complaint? Download this politely drafted Thank You Letter Receipt Consumer Complaint response letter including complaint form now! This letter is created by a Consumer Protection department of an Antitrust Bureau of the Attorney General’s Office and is sent to those consumers who send in legal complaints. It firstly is thanking them for their effort of taking the time to send in a proper complaint. This letter also attaches the complaint form of the Bureau’s Consumer Complaint Form. The Bureau prefers that all complaints be submitted in writing in order to be fully and formally evaluated. Please provide as much information as possible to help us assess your complaint. 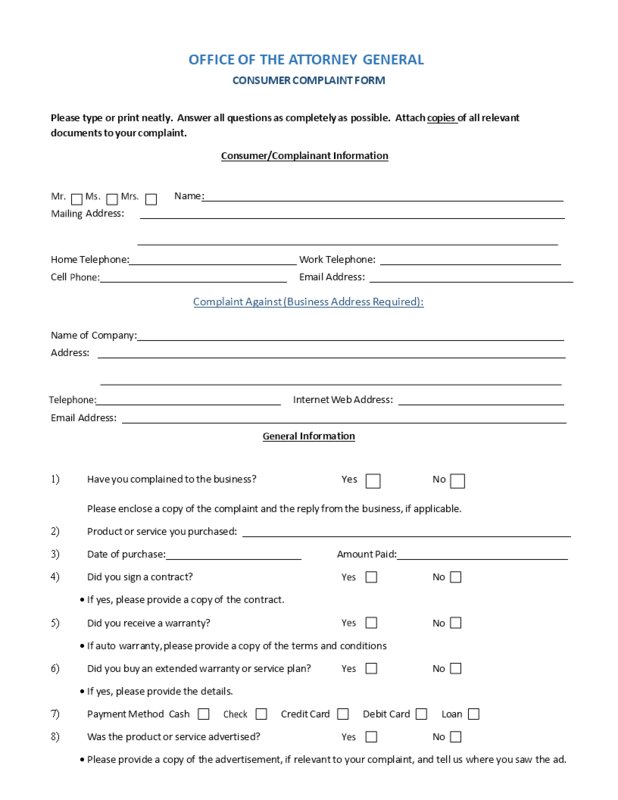 If you want to file a complaint that alleges a company doing business in New Hampshire has engaged in some sort of unfair or deceptive business practice, please complete this complaint form and attach to it copies of all documents which support your claim. In the response, it's important to mention that the complaint will be read and reviewed in the order that it was received. That process may take some time and your patience is appreciated, as the Bureau receives over thousands of formal complaints and phone calls per year to our consumer information line. This Thank You message will capture your receiver's attention for sure! For those who are working in the field of Consumer Relations, sending such a collective or individual Thank You response to the consumers from time to time can work very motivating for the receivers! The right stimulation will help you to achieve mutual goals faster and will benefit your results! After downloading and filling in the blanks, you can easily customize e.g. style, typography, details, and appearance of your complaint form and letter. Download this Thank You Letter Receipt Consumer Complaint Form template now and start sending it out today!